How many of you knew that Tampereen Teatteri did a production of the musical Les Misérables in 1984 - a whole year before the now-26-year-old London production had its premiere? According to a book about the theatre's history, Panu Rajala's Tunteen tulet, taiteen tasot, Tampereen Teatteri was the first theatre outside Paris to do a production of Les Misérables – though in reality, a Croatian theatre called Komedija Theatre had staged the show in 1983 already. Nevertheless, an impressive feat: a production based on the concept version of what later became the world's most popular musical. Back then, the show wasn't called Les Misérables, but Kurjat, which is the book's Finnish title. Someone had seen Les Mis's concept version in Paris and fallen in love with it, and the idea was born that it should be imported to Finland. Apparently, it was thought from the start that the piece was be too big for Tampereen Teatteri to do, but they did it anyway, with Rauli Lehtonen directing. He thought it was "a fun piece, with a lot of energy..."
First of all, the show had a very mixed reception. 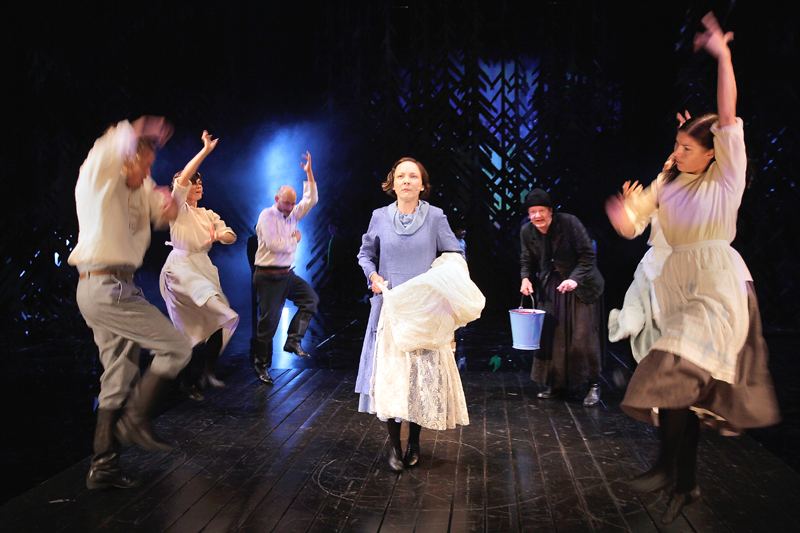 Aspects like costumes, sets and the ensemble's ability to sing and move in the same rythm were criticised. The book guesses the criticism was because they didn't have enough time to train the choreography properly. 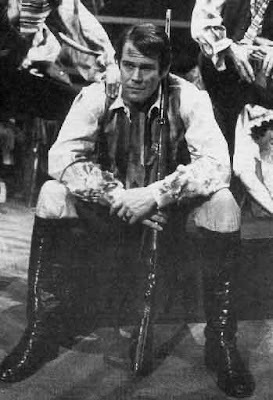 Then again, though, the actors playing Valjean, Marius and Javert (Reijo Lahtinen, Markku Niemelä, Tapani Perttu) got praise for their singing. One critic really liked the barricade scenes, saying the direction worked the best there. As a whole, some critics said it's new and different musical theatre, but others blamed the source material itself for being unever and unfinished and running through the book's plot too quickly. Maybe that's a problem even with the show as we know it today, trying to shove 1400 pages of events into three hours, but the concept version suffered from that even more strongly: the show begun at At the End of the Day, so you were just supposed to know what had happened beforehand. Iconic songs, like Bring Him Home and On My Own, weren't a part of the piece yet. It was clearly still work in progress. That doesn't mean it had to flop, though. It was a pretty good show already. 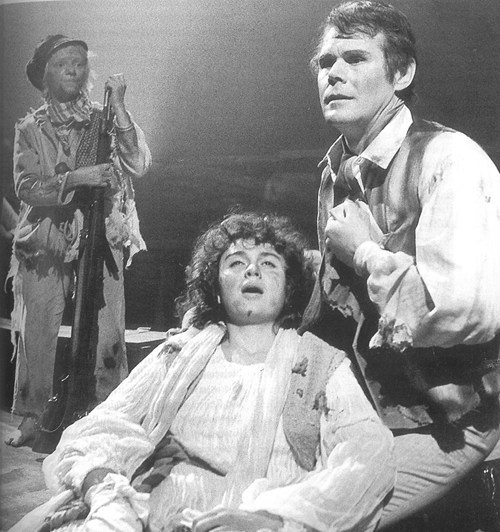 The original 85 London Les Mis had a bad reception among the critics, too, but audiences still loved it! Not in this case. Tampereen Teatteri's 84 Les Mis wasn't as popular as the theatre hoped it would be. It had 44 performances and less than 22 000 watchers in total. Compare that with Helsingin kaupunginteatteri's 99 version and its almost 130 000 watchers, even with ÅST's over 45 000... Not exactly an amazing result. In 2013, after 29 years, Tampereen Teatteri will stage Les Misérables again. I'm torn between hysterical joy and hysterical panic. I'm hysterical with joy simply because we're getting Les Mis in Finland again. It's of course my absolute favourite musical. You couldn't have it any better, being a Mizzie around here. I think we were all prepared to wait for another ten years or so before seeing the show in Finland the next time, but wouldn't you know, we can go back next year already! But the things I'm worried about... They are so many. Cast is certainly one thing, but it's maybe the smallest of my worries. In ÅST, every role was cast quite spot on, so I've been spoiled. I try to remember that's rare and not to get my hopes too high! I've also seen performances with a weak Fantine, with a weak Enjolras, a weak Thénardier, even a weak Javert... And I've still enjoyed myself. I of course hope every role will be cast brilliantly, but seeing the only time I've felt bored and annoyed at Les Mis was the time I saw a very bad Valjean... It seems as long as the main role is chosen well, I can live with a miscast or two. There's of course the matter of how the production will look like, and that makes me a bit more nervous. Seeing that it doesn't usually happen in Finland, I doubt they're copying the original production nor the 25th Anniversary Tour... But something tells me to be slightly afraid of two things. In a nutshell, I don't know what I'd like the production to look like, exactly, but I sincerely hope it surprises me. My biggest worry, however, is the translation. I know many people don't even pay attention to translations while seeing musicals. There's pretty singing, the tune tells how the character is feeling already, so who cares if the words they sing are a little clumsy! I doubt many even notice. Personally, however, I'm a bit of a translation freak and always love hearing good Finnish versions. Sadly, if the libretto won't be revised, I'm not going to enjoy Les Mis in my native language. The Finnish libretto is by Jukka Virtanen and Kristiina Drews, and while those two have translated a lot of musicals and sometimes even done a good job... Les Mis is hardly a high point in their career. The translation is available for everyone to enjoy as the Finnish subtitles on the Les Misérables 25th Anniversary Concert DVD, and it was also used as subtitles at Åbo Svenska Teater. If just reading it while it hovers onscreen makes me bury my face in my hands with confusion and embarrassment... How will it sound like sung? I'll give you an example. Remember the scene where Valjean asks Enjolras to "give me the spy Javert, let me take care of him"? Give that bit a round of Virtanen/Drews treatment and translate it back into English, and you have "I will do the spy!" Sure you will, Valjean, sure you will, in various imaginative ways - too bad, though, that this isn't a piece of silly fanfiction but the real musical, written to be taken seriously! That is of course not the only unintentionally funny or otherwise weak moment of the translation. I seem to recall some bits, like On My Own, were pretty good, but sometimes the tone of the scene and the words sung simply argue with each other. I wonder if a new translation is too much to hope for, but I certainly hope the theatre will at least find someone to go through the existing libretto and fix the most glaring mistakes. Tampereen Teatteri's Les Misérables, 2013 - now with 100% less spy-doing..? Source for the 1984 Les Mis part: Panu Rajala - Tunteen tulet, taiteen tasot. First photo from Rajala's book, second from here. Warning: this entry will contain spoilers for the classic Finnish play (and now, a musical) Anna Liisa. They don't want any of us here graduating middle school without knowing what it's about, but seeing most of us slept through those classes... Maybe consider this as a lesson in Finnish literature if this is new to you. I've never seen a Finnish original musical before Tampereen Työväen Teatteri's Anna Liisa. It's silly. I spend half of my time online shrieking about Finnish musical theatre, yet it took me this long to see a show created from start to finish in this country. It's easy to point out what's kept me away. The last reason, of course, is good old prejudice. It's done here in Finland, there's no way they can compose anything that compares to stuff from Broadway! Luckily, Anna Liisa proved at least the third thought wrong. 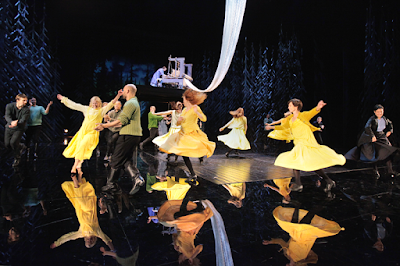 There is no reason why original Finnish musicals couldn't be as enjoyable as imported shows. Anna Liisa is, originally, a 19th century play by the Finnish writer Minna Canth. It tells a story of a young woman who is getting married while hiding a huge secret: years ago, she gave birth to another man's child - and, in her extreme distress, killed her baby right after it was born. Not a very cheerful story, but then again, when have musicals ever been? Ever since West Side Story, they've been mostly about death and sorrow already - Anna Liisa is just following the genre's traditions. This haunting story was combined with, in my opinion, quite nice music by a band called Hehkumo. I think the show's programme says it well: Hehkumo creates unique music. Its roots and foundation are in folk music, but the result is new music that fits the modern day. The music wasn't traditionally musical-ish. I don't think it would fit a show set in a modern period, but it suited the rural 19th century story well. The tunes were more about setting the tone of the scene and explaining the character's personalities and motives than bringing the events forward. Luckily, unlike for example in Ghost, that seemed like a good decision. While I've only read short snippets of Anna Liisa and can't say for sure, I suspect that most of the dialogue was directly from Canth's play. Trying to convert a monologue about a woman killing her child into a showtune seems like an endeavor that's doomed to fail in nine out of ten cases - I'm glad the music took a different route. The lyrics of the songs, also a bit old-fashioned but in a positive way, suited the spoken dialogue's style. The band was onstage, playing the tunes and also taking part in the action sometimes. I liked that, it didn't feel gimmicky. The band seemed like a seamless part of the rest of the cast - a cast that handled their singing parts nicely, by the way. Acting-wise, I felt to me some moments were done a little too loudly, there seemed to be a little too much shouting and exaggeration at times. Luckily it didn't distract me too much. Judging by the people sitting next to me, sobbing as the events progressed, it didn't ruin others' experience either. There also was a lot of dancing. I don't know lots about dance styles, but Anna Liisa's choreography felt nice to me. It wasn't distracting, it didn't scream "look at us dance and then the show will proceed". It felt like a integral part of the piece. There was a character called Minna Canth onstage. She opened both acts by talking about the way the author saw her own play. I don't know if the show would've been significantly different without her, but she didn't annoy me. Her t-shirt, however, did. Everyone else had a nicely timeless wardrobe, even though some pieces of clothing were based on modern styles it was done in a stylish way... And then there's a character with a bright t-shirt that reads ANNA LIISA on the front. I know I shouldn't let that irritate me, but it broke a bit of the illusion for me. There are only three performances left next month. If you happen to be hanging around Tampere these days, I recommend. But wait! There's more to this. The thing I'm the most impressed of here, actually, is Tampereen Työväen Teatteri releasing a CD with Anna Liisa's songs. I listen to musical albums every day, but until this, Finnish ones have been lacking from my collection. my collection. I know there's been a small handful of Finnish musical cast recordings before, but Anna Liisa is the first one I've encountered - and I've truely enjoyed this rare chance of revisiting the show after returning home. In Anna Liisa's case, it probably was as easy as it can be to decide about recording an album. It's a new show, so there was no need to negociate with any producers from some foreign country. Still, I can't help hoping they'd record Finnish productions of international musicals, too. I continue being upset that there wasn't a CD of either Åbo Svenska Teater's Les Misérables or the Seinäjoen kaupunginteatteri's Tanz der Vampire. With about 48 pre-existing Les Mis albums in dozens of languages, I have to admit the former decision isn't impossible to understand. But then there's Tanz. The best Finnish translation I've ever heard; a cast I've preferred to every single Tanz album I've listened to so far; a large, partially international fanbase... I think it would've been worth recording. I also think Svenska Teatern, with their sold-out-until-2013 production of Kristina från Duvemåla, is making a mistake if they don't release a CD. If even the Swedish have done cast recordings for Les Mis, Phantom of the Opera and so on, I don't see why the Finnish couldn't get at least a small highlights album of some Broadway show done. Logo by Anne Sillanaukee and Kari Sunnari, photos by Jyrki Tervo / Tampereen Työväen Teatteri.